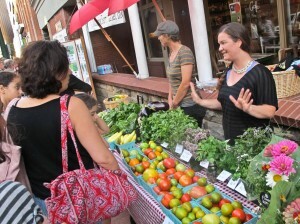 Create/find a distribution system to sell locally-grown foods. 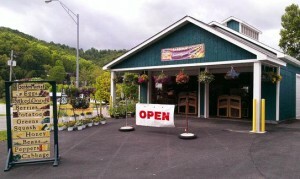 The Wild Ramp in Huntington distributes local food and products from multiple counties. The financially successful distributor is volunteer-run. Photo courtesy The Wild Ramp. In 2010, three Marshall University students decided they would create a food hub in Huntington for their Senior Capstone project. Two years later, The Wild Ramp opened as an open-air market that would take local products and market them to the public. By January 2014, they had returned more than $350,000 to food producers. With help from the federal Farm to School program, the Office of Child Nutrition has been promoting distribution systems that allow WV foods to compete with packaged out-of-state foods in sales to the schools and other state institutions. And the West Virginia Food and Farm Coalition has an active working group that helps local people develop models that can work in their area. 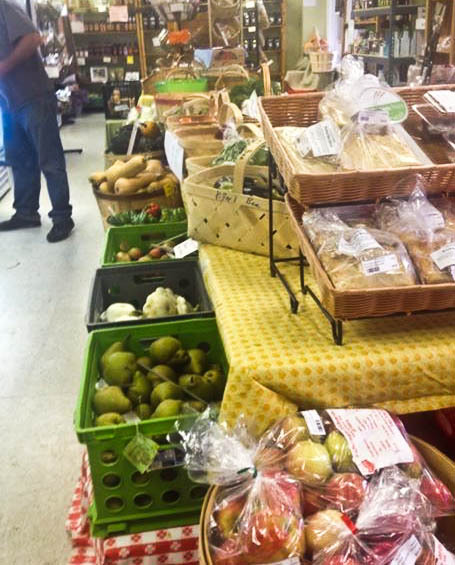 The Barbour County Community Garden Market operates in a former IGA store. Farmers drop their produce off for staff to sell. Photo courtesy the Market. 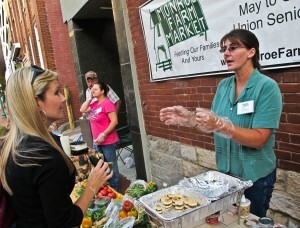 Kanawha Valley Consumer-Supported Agriculture. In this model, customers pay an up-front fee and, each month, receive their share of produce in season. Customers receive whatever vegetables, herbs and fruits are currently available. 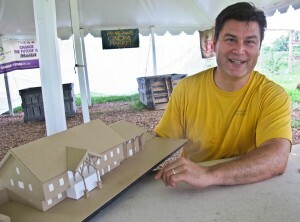 http://www.wvgazette.com/News/201306060231 and https://www.facebook.com/groups/479103195470770/. 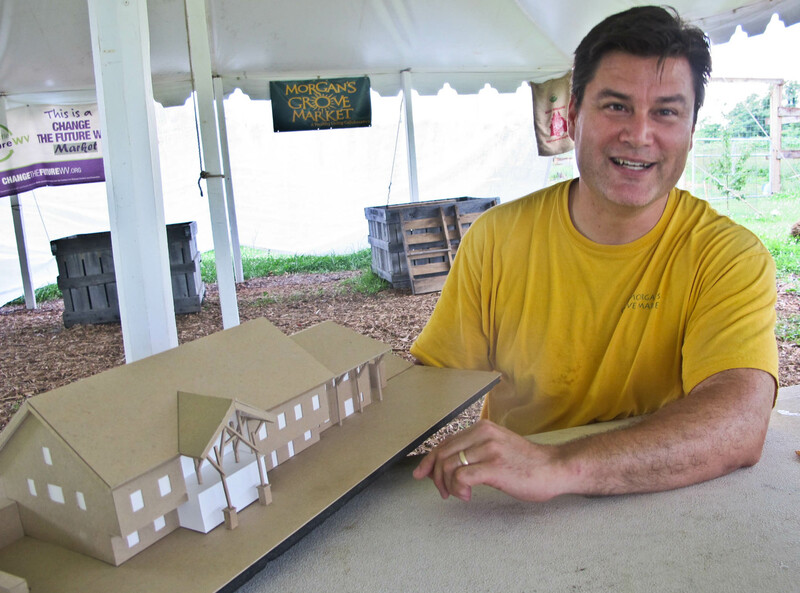 Managing partner Peter Corum shows off a model for the future Morgans Grove Market that will house farmers market, medical clinic, community gardens and associate businesses. Morgans Grove Market, Shepherdstown. Now a Saturday-morning farmers’ market, its development plans include include an all-week farmers market in which farmers will drop off their produce, health care services housed in the same building and a regional food distribution system. https://www.facebook.com/morgansgrovemarket. The West Virginia Food and Farm Coalition put together several videos of successful West Virginia food distribution businesses: The Wild Ramp, Kilmer Farm Market & Orchard, Working H Farms, and Hudson Farms. Hard copies of all reports available from West Virginia Food and Farm Coalition: www.wvhub.org/foodandfarmcoalition. Have something to add to this page? Write it in “reply” below, with your contact info, in case we have questions. Would you happen to have any available information on food safety regulations for West Virginia? I am a graduate student working to help develop a business model for a group out of Calhoun County, and I have had no luck finding the regulations they would need to follow for fresh vegetable production, harvest, packing, storage, and sales. Any help would be greatly appreciated.